James Raven is a student of life. He draws on knowledge and experience gained through the school of hard knocks and through a long career in both federal and state public service. After publishing his first nonfiction book on separation and divorce and having some success, he realized that he had the creative ability to pursue writing in the genre that most interested him—a world of possibilities, adventures, and excitement. The inspiration for Sentinels of Tzurac, and for others to follow, was born out of the desire to give to the reader the opportunity to escape the everyday mundane life by living and experiencing a new world. Through expanding the imagination and feeling the emotions of the struggle between good and evil, he takes the reader on a journey into another dimension to join him in the thrills of sci-fi adventures. The year is 2055. Earth’s natural resources have been ravaged and the planet is slowly dying. MERIC, the mining company owned by Samuel Jensen that employs Kyron, is now mining a newly discovered planet known as Terra Iota when an explosion rocks their operations and brings them to a screeching halt. A strangely powerful blue crystal they will come to know as Xytrinium is cause of the explosion and Kyron is sent to Terra Iota to investigate. Saying goodbye to his love Torri, Kyron embarks on a journey to the distant planet, unaware that evil forces lurking within his own company don’t want him to arrive on Terra Iota alive. Someone is moving behind the scenes to control all of the volatile substance now known to be Xytrinium and his motive is as simple as it is diabolical: he is determined to exert complete power over the entire world. Caught in the middle, Kyron now finds himself in a war with a man who seems to hold all the cards; and when a murder, an ancient gold ring, and his father’s hidden past reveal startling truths, Kyron will risk everything to save Earth—and the life of the woman he loves. Kyron knows that he’s hated by his nemeses, but he doesn’t yet know that he’s hunted by them. Thanks to Kyron, it’s been five peaceful years since Jackson and Khaneera were sentenced to life in prison for their crimes against the Federation. The reserves of the valuable crystal resource Xytrinium are being stockpiled safely and securely on Terra Major-Earth, and the planets future is slowly beginning to brighten. But unbeknownst to Kyron and the Federation, Jackson and Khaneera have escaped and are launching an even more daring attack than before- with Kyron’s assassination as one of their key objectives. 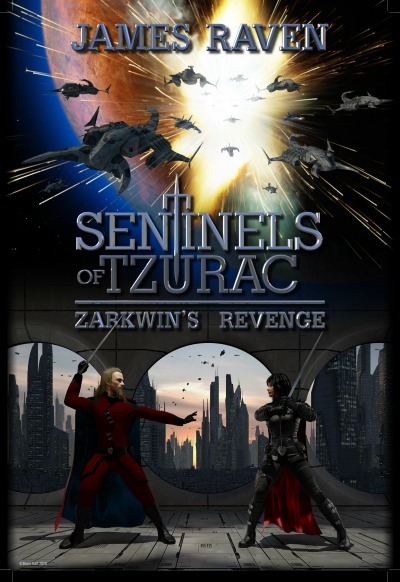 A riveting continuation of the Sentinels of Tzurac trilogy Zarkwin’s Revenge will have you revelling once again in the lives, loves, fears, and moral quandaries of James Raven’s frighteningly believable, not-so-distant future. A sinister army gathers for a deadly strike against the Tzuracian Federation of Planets. A stolen formula capable of creating super-soldiers has fallen into the hands of one of the most dangerous evil forces in the Universe. A fugitive Sentinel is on a mission of redemption while trying to earn forgiveness for his foolish youthful naïveté and its near catastrophic results. Step into the exciting fantasy world of the Sentinels of Tzurac-Retaliation, where science meets science fiction and the threat of intergalactic war is imminent. A two-pronged Treldarian attack promises to devastate not only Terra Major (Earth) but also the very Sentinels of Tzurac themselves. Will the Sentinel deserter Yarron Blandhar prevent a devastating invasion and stop the Treldarian forces from destroying everything he holds dear? Or will all be lost as the source of the Sentinels’ power is turned against them?